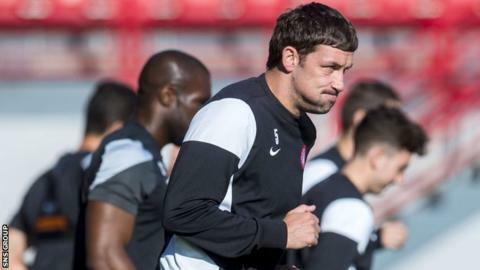 Player-manager Martin Canning insists he is ready to start for the first time in six months, with Hamilton Academical short of central defenders. Lucas Tagliapietra is suspended for Saturday's game against St Johnstone and Michael Devlin has an ankle injury. Canning, 33, made his first appearance of the season as a substitute in last weekend's 1-1 draw at Partick Thistle. "I have said all along that I will keep ticking over and if I'm needed I will be there to play," he said. "We will have a couple of options and it's something I will need to think about. "I have played four or five 20s games and friendlies this season so I'll be ready to go." Canning's last start came against Saints on 4 April, when he was sent off. Against Thistle, he came on for the final half hour, shortly after his side had fallen behind. "I could maybe have done it a bit sooner but I was struggling a bit with a wee pulled muscle in my stomach and I didn't want to put myself out of this weekend and come back off in that game as well," he explained. "When we lost the goal I felt it was the right thing to do to put myself on and fortunately it paid off. It's cleared up now."